Almost overnight the Kagyu Monlam Pavilion had transitioned from a cool, elegant space appropriate for sutric-based prayers for world peace into a fiery, dramatic hall dedicated to the wrathful practices of those fierce deities who protect the dharma, and in particular the lineage of the Gyalwang Karmapa. The first day of the Great Encampment Mahakala Main Puja began at 4 am today. 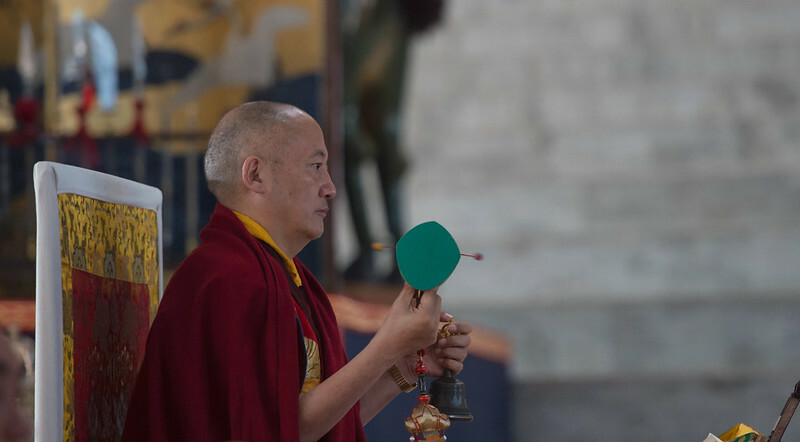 And although the 17th Gyalwang Karmapa did not personally attend, esteemed rinpoches, khenpos, monks, and nuns, led by His Eminence Goshir Gyaltsab Rinpoche, impressed lay devotees with their powerful melodious chanting accompanied by cymbals, horns, drums, and occasional bouts of eerie, rhythmically-timed guttural utterances. The text being used this year for the main puja is the longest ritual of Mahakala Bernakchan in the Karma Kagyu Lineage and has an interesting history. It is called Incinerating the Hostile ( Tib. sDang ba rnam sreg), and was written by the Sixth Karmapa, Thongwa Dönden (1416-1453), at the request of the First Gyaltsap Rinpoche, Paljor Dönden (1427-1489). The monks, however, named it “The Boring Mahakala” because it took so long to chant, and eventually it was replaced by an abridged version composed by the Fifth Shamar, Konchok Yenlak, at the request of his teacher, the Eighth Karmapa, Mikyö Dorje. These days, this abridged text is known as The Ritual of Mending and Supplication (Tib. bsKang gsol), and it is practiced widely in Kagyu monasteries and centers. The longer version of the ritual, Incinerating the Hostile by the Sixth Karmapa had fallen out of practice for so many years that it was very difficult to find a copy. The Seventeenth Karmapa had looked everywhere for an original and no one, inside or outside of Tibet, had ever seen or heard of it. But the present Gyaltsap Rinpoche happened to obtain a photocopy of a hand-written version, and he lent it to His Holiness in time to make 500 copies for the grand Mahakala event in Bodhgaya in 2012. This long Mahakala ritual, Incinerating the Hostile makes an auspicious connection with all that is excellent. It is said that chanting it will cause the Dharma to flourish widely and bring benefit to immeasurable numbers of beings. In addition, Mahakala Bernakchan consumes all that is negative, all adverse conditions, and all those who make obstacles for the Dharma. Everything that is adverse, especially from the previous year, is eliminated. The actual puja is broken up into six sessions (from 4 am to 9:30 pm), punctuated with several short breaks, with a longer break for lunch. However, even during the breaks, a small group of young monks sitting off to the side of the main stage must keep up a continuous harmony of mantras, thus their sonorous recital assures that the puja will continue in an unbroken stream throughout the day. A mysterious, almost otherworldly atmosphere has been created and sustained by a powerful combination of chanting, music, incense, and visual elements strongly reminiscent of the gönkhang (protector shrine rooms) usually hidden away deep in the recesses of most Tibetan monasteries. As master set designer and director, the 17th Gyalwang Karmapa has distilled the essence and transformed the Monlam Pavilion into a contemporary version of a Tibetan monastic setting perfectly suitable for this traditional Gutor puja.